Delhi, Mandawa, Bikaner, Jaisalmer, Jodhpur, Udaipur, Ranakpur, Jaipur, Agra, Fatehpur, Sikri, Varanasi, Kathmandu, Pokhara, and more! 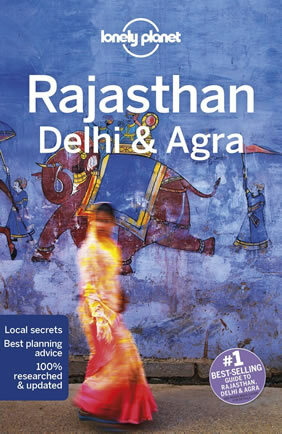 Soak up the history and wonder of Rajasthan's romantic temples and palaces. 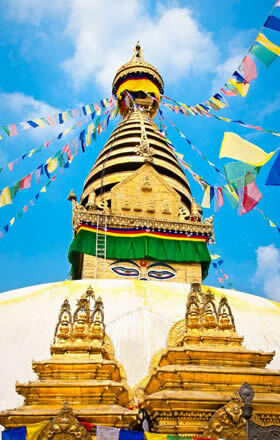 Then head to Nepal - Kathmandu, its capital, is one of the world's oldest cities, full of culture and charm. Take in the mountain panoramas of the Annapurna Range and discover the snow-clad peaks, lakes and rivers of the Pokhara Valley. Simply breathtaking. The very name Rajasthan conjures up the image of hill top fortresses, maharajas with scimitars riding the painted elephants, the exquisitely carved havelis and the royal hunting grounds. Our Rajasthan tour is designed to offer you a peek into that era of opulence, indulgence and artistry which even now makes Rajasthan one of the most popular tourist places to visit in India. From the vibrant bazaars and resplendent fortresses of the pink city Jaipur to the city of lakes Udaipur with its floating palaces and from the camel safari in the sam sand dunes of Thar in Jaisalmer and Bikaner, this tastefully crafted Rajasthan holiday is your ticket to a bygone era of elegance pomp and romance. Arrive Delhi. Meet and greet at the international airport. Transport to the pre-booked hotel by our very own tour representative. Relax and later proceed for city tour of Delhi: Laxmi Narayan Temple, Jantar Mantar, President House, Parliament House, Lotus Temple, Humayun Tomb, Qutab Minar, Red Fort, Jama and Raj Ghat. Overnight stay at the hotel. Breakfast and drive to Mandawa. Upon arrival transfer to hotel. After few hours, take a tour of the painted ‘havelis’ (mansion): Chowkhani Haveli, Gulab Rai Ladia Haveli, Lakshmi narayan Ladia Haveli, Mohahanlal Saraf Haveli and Bhagchandika Haveli. Watch the splendor of almost 100 year old frescoes. See the open air art gallery of Rajasthan; this region came into prominence in the 14th century when a number of Muslim clans moved into the area and the towns of this region developed into important trading posts on the caravan routes emanating from the ports of Gujarat. Overnight stay at the hotel. Breakfast at the hotel. Drive to Bikaner. On arrival transfer to hotel. Get fresh and then visit Junagarh, Devi Kund, BhandasarJain Temple and Ganga Golden Jubilee Museum. Overnight stay at the hotel. 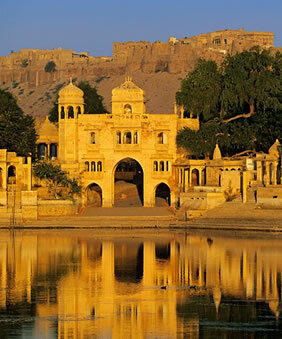 Leave after breakfast for the Golden city of India – Jaisalmer. Enjoy the ride on the empty roads, watch the camels, and at certain places - the deers and other wildlife – upon arr. Later proceed for a walking-tour: havellis - Nathmalji ki Haveli, Patwon ki Haveli and Salim Singh ki Haveli. In the evening watch local dances at a restaurant while having dinner. Overnight at hotel. Breakfast at the hotel. Visit the fort, bazaars and old havellis. Overnight stay at the hotel. Breakfast at the hotel. Drive to Jodhpur. 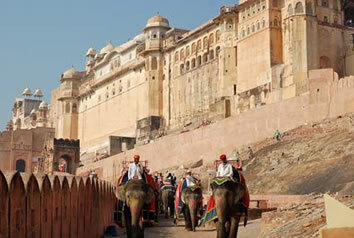 In the afternoon visit Meharangarh Fort situated on a low sandstone hill, Moti-Mahal and Phool Mahal. 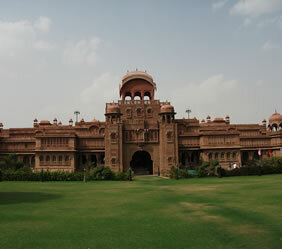 Also visit Jaswant Thada, an imposing Marble Memorium built in 1899 and the museum located in the UmaidPublic Gardens. Overnight stay at the hotel. Leave after breakfast for Udaipur visiting Ranakpur on the way – the beautiful sculptured Jain temples. Continue to Udaipur. Upon arrival, transfer to hotel. Relax and enjoy the surroundings. Overnight stay at the hotel. Breakfast and proceed for morning-tour of Udaipur. Visit the City Palace, Jagdish Temple, drive around Fatehsagar Lake, Sahelion ki bari (Queen's resort for her friends) and Bhartiya Lok Kala Mandir (Folk art museum). Free-afternoon. Overnight stay at the hotel. After breakfast drive to Pushkar in the district of Ajmer. Visit the holy Lake and also the famous Brahma Temple. 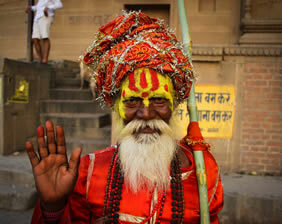 Pushkar is one of the most holy places for Hindus. Overnight stay at the hotel. Breakfast at the hotel. Leave for Jaipur. 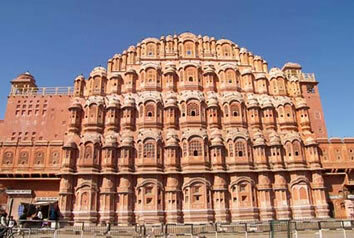 Jaipur is the pink city of India, jewel in the desert sands of Rajasthan – settled in the rugged hills of the Aravalis. The capital of Rajasthan, it was given a color coat of pink a century ago in honor of a visiting Prince and ever since, it has retained this color. Built by Maharaja Jai Singh, the notable astronomer, this city is 260 years old. The city is remarkable for its marvelous architecture and town planning as it is for the lively spirit of the people who inhabit it. Upon arrival check-in to hotel and later proceed for a drive around the city. Overnight stay at the hotel. Breakfast and proceed for full-day city tour. 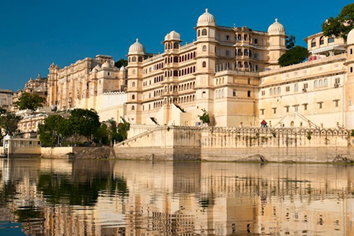 Visit Amber Fort - the ancient capital of the State and Sheesh Mahal, Maharaja's City Palace and the Observatory. Drive past Hawa Mahal and through the pink rose residential & business areas. Overnight stay at the hotel. Leave after breakfast and drive to Agra. On the way, visit Fatehpur Sikri – the deserted city built by the third mughal ruler Akbar remained as the capital of the empire from 1570 to 1585. The Important Features of the fort are Shahi Darwaza (Kings Gate), Tomb of Sheikh Salim Chisti, Palace of Jodha Bai, Birbal Bhawan, Panch Mahal, Hide & Seek Palace and Hall for the Common. Later continue to Agra. Upon arrival transfer to hotel – overnight stay. At sunrise visit Taj Mahal, see the well preserved and beautiful architecture of the monument. Return to the hotel for breakfast. Later visit Agra Fort and Sikandra Tomb. Late-evening leave for Varanasi by train. Overnight travel. Upon arrival transfer to hotel – breakfast and rest. Later proceed for city tour: Durga Temple, Bharat Mata Temple, Shri Kashi Vishwanath,Tulsi Manas Temple and Banaras Hindu University. Return to the hotel. Overnight stay at the hotel. At sunise, visit the Ghats. 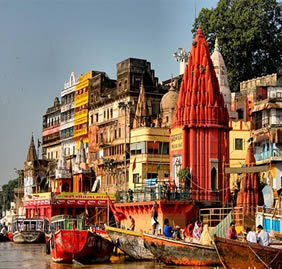 Go for boat-ride to various Ghats: Dasawamedh Ghat, Manikarnika Ghat, Man Mandir Ghat and Lalita Ghat. Later proceed to Sarnath. Rest of the day free for independent activities - explore the bazaar. Later see the evening prayer at the ghats. Overnight stay at the hotel. Leave after breakfast and transfer to the airport for flight to Kathmandu. Upon arrival transfer to hotel. Overnight stay at the hotel. Breakfast at the hotel. 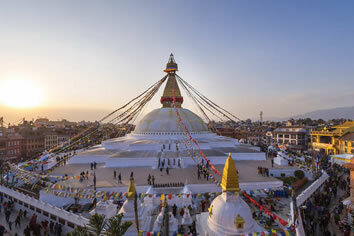 Later visit Durbar Square, Hanuman Dhoka, the ancient royal residential quarter, Mahadev and ParvatiTemple and other temples. Free-time, rest of the day. Overnight stay at the hotel. After breakfast drive to Pokhara. Upon arrival check-in to hotel and relax. Later proceed for half-day city tour visiting Phewa Lake. Overnight stay at the hotel. Breakfast at the hotel. Later visit Barahi Temple, Mahendra Cave and Pokhara Old Bazaar. Overnight stay at the hotel. After breakfast drive to Katmandu International airport for Delhi. Upon arrival, transfer to hotel, overnight stay. Breakfast at the hotel. As per your flight timings leave the hotel and drive to the International airport. Departure. • 19 nights accommodation in 3 and 4 star modern and heritage gay friendly hotels with all facilities. • Breakfast provided at hotels. 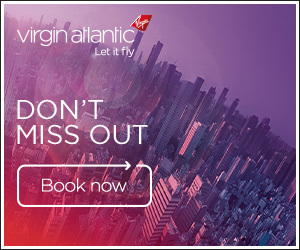 Coach, car, train & tour flights. Transportation by air conditioned coach with English speaking gay friendly driver. Arrival airport to hotel transfer included. Please provide flight details at time of booking. This trip does not have any specific gay hosted events, meals or day tours due to the cultural sensitivity of this region. We will do our best to provide a safe, comfortable environment for you and your fellow travellers to experience this culture. However, you will find an exciting gay nightlife in Delhi, mainly in the south area where parties are organised by gay organisations, ocassionally and in the weekends. You can also choose to go for massages and spa services in some of the gay-friendly saunas located in Delhi. 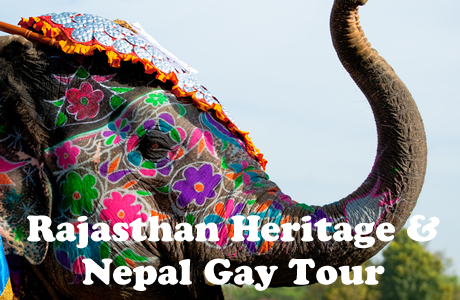 Nepal is well known as the gay-friendliest country in south Asia - you will find some gay bars and clubs in Kathmandu. Allow approx USD $450 for meals not included.